Hi guys! I hope you had a fabulous weekend. I had to take Mr. Bloo back to the vet. He lost another pound, and his weight has dropped to just 6 pounds. His vet is completely perplexed as his kidney seem to be working fine, and his thyroid tests came back normal. Since he had his front teeth pulled, his weight has just been dropping. I'm hoping that it's just because he had to switch from dry food to wet food, and he cannot graze throughout the day like he has done his whole life. The vet suggested that I sit out a buffet of different foods to see what worked. He nibbled throughout the day on his wet food when it was fresh, a little dry food, and dry food soaked in water. (He wouldn't touch the bowl of chicken broth or dry food in chicken broth). So I'm going to keep the things that he liked out, and hopefully that will get his weight to stabilize. Otherwise, they are going to give him an appetite stimulant and do chest x-rays. Enough about my sick kitty saga... Today I have an awesome glitter topper from Digital Nails - Timey Wimey. It is based on one of my favorite Doctor Who episodes (Blink). Timey Wimey is described as "an insane blend of purple, teal, aqua, chartreuse, hot orange-pink, & tangerine glitters in a multitude of shapes and sizes." 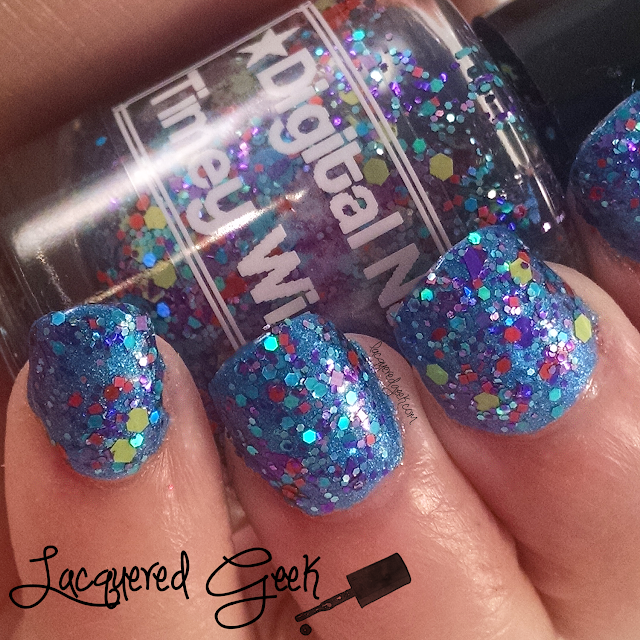 It's got tiny holos, shreds, hexes, and GIANT dots! In other words... a glitter lover's dream! Next time I wear it, I am not going to put it over blue undies. The blue glitters got a bit lost in it. I did have some trouble getting the big dots on my brush. I was getting so much other glitter on my nails, that I didn't bother to fish for them. Strangely when I was trying to take a few shots of the bottle and brush, I got the dots every time! 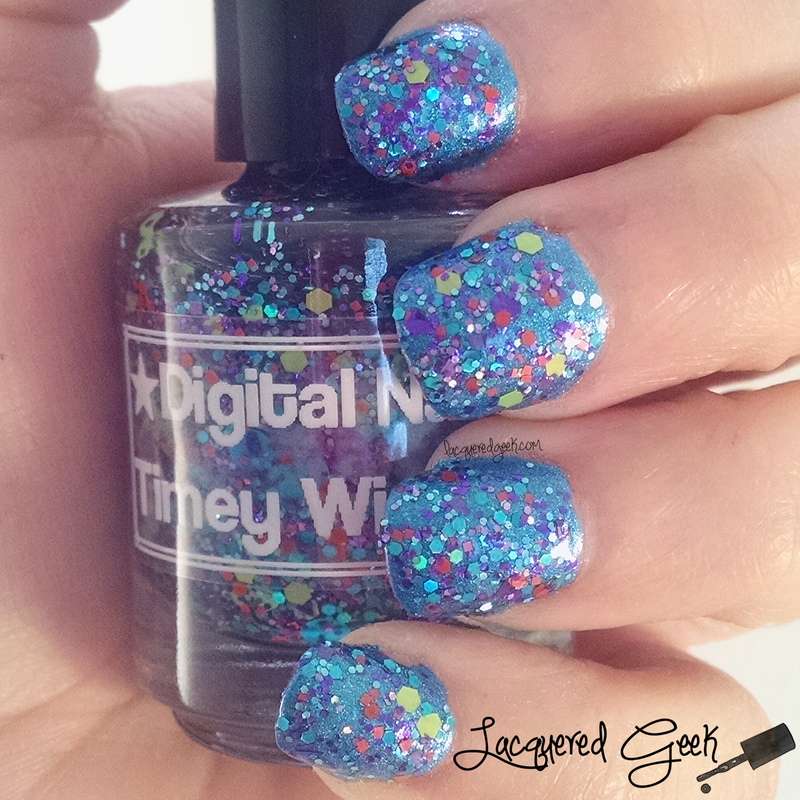 Timey Wimey is available now from Digital Nails. So what do you think about this super fun polish? Do you love glitter as much as I do? Super cute!! I love a good glitter bomb every now and again. I love glitter polish, but this one does nothing for me. That makes me really sad because I love Doctor Who. I like glitter, LOVE doctor Who, but this one didn't really speak to me. I love it on you! Your poor cat-baby! I hope he feels better soon! I always see Digital Nail's nerd-themed colors and love the inspirations. I can't resist Doctor Who polish! Your poor kitty =(. I hope he adjusts to the wet food soon. I always have mixed feelings about glitter bombs. It looks great how you paired it, but it's probably not something you would find in my stash. 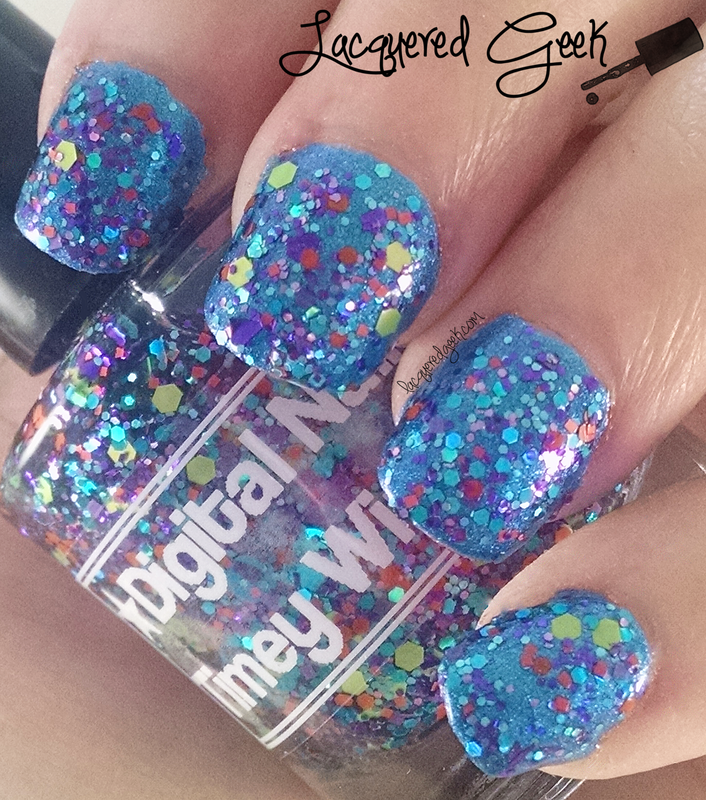 Really pretty glitter topper. I love chunky glitters like this! Sorry your kitty is not well! Hope they figure out the problem soon. As for glitters toppers, I am not much of a fan myself but love them on others.